In the popular children’s book I Can Read with My Eyes Shut! Dr. Seuss wrote, “The more that you read, the more things you will know. The more that you learn, the more places you’ll go.” It’s a simple but inspiring quote—an encouragement to young readers to devour literature and expand both their imaginations and practical knowledge. But for many children across the country, simply gaining access to books can be a challenge. 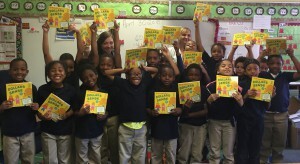 “In middle and low income communities, there is an average of just one book for every 300 kids,” says Anna Anderson, manager of strategic alliances with First Book, a nonprofit organization dedicated to putting literature in the hands of students in need throughout the United States and Canada. First Book works with several corporate partners to make this possible, including TD Bank. TD has partnered with First Book for the past five years to bring new books to children in need through large-scale book truck events and through the bank’s school-based volunteer program, Banking on Books, both of which are coordinated through TD’s community relations department. In 2015 alone, TD provided more than 215,000 new books to children across its market area. According to national study by the American Educational Research Association, students who do not read on grade level by the third grade are four times less likely to graduate than proficient readers. Poverty compounds the problem: students who have lived in poverty and don’t read well are 13 times more likely to drop out or fail to graduate on time. And when it comes to financial literacy, other studies have shown the importance of providing instruction early—students who are taught about financial concepts during their K-12 education have significantly higher savings, higher credit scores and higher net worth throughout their lives than those that don’t, according to a report from the U.S. Treasury Department. In preparation for its 20th annual Teach Children to Save Day on April 29, the ABA Foundation recently launched a new program in partnership with First Book: the ABA Foundation Book Award Program. Through the program, bankers can supplement their Teach Children to Save curriculum by providing books to the classrooms they visit. 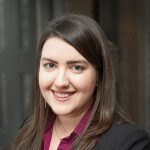 Central Bank of Kansas City, a $135 million community development financial institution in Missouri, was among the first banks to pilot the ABA Foundation’s new program, and marketing director Sarah Cousineau quickly embraced the idea. “It was super exciting for me, so I just ran with it,” she says. For Cousineau, encouraging literacy comes with a personal connection. Friends of her family started a local literacy initiative called Lead to Read, which pairs volunteers with students in local schools to spend time reading one-on-one. Cousineau has been involved with the organization for over four years, volunteering each week during her lunch hour at Wendell-Philips Elementary, a school in the bank’s service area. She has also assembled a team of six bankers who each take turns visiting a fifth grade classroom at nearby Garfield Elementary to read with a student there. These existing relationships with local schools provided the perfect opportunity for Cousineau and Central Bank of Kansas City to make a difference with the Book Award Program. 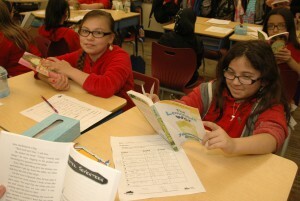 Cousineau organized book award events in a total of six classrooms at Wendell Philips, Garfield and Scuola Vita—a charter school—and worked with the teachers to select age-appropriate titles. The teachers then purchased the books through First Book’s online bookstore. “The teachers really know their kids—they know what will interest them,” Cousineau says. “They know their reading levels, so being able to actually go online and purchase the books was a great idea. You could tell from the kids’ faces that [the selections]were right on target,” she adds. The Book Award Program offers a catalog of 16 financial education titles for various age groups from pre-kindergarten through 12th grade. Stories like Lemonade In Winter, Bunny Money and Toothpaste Millionaire teach children the important concepts of saving, responsible spending and entrepreneurship through fun, relatable stories. Among the titles selected for her classrooms, Cousineau says the Berenstain Bears books were a particular favorite. Citi recently joined on as a major partner with the ABA Foundation Book Award Program. Throughout 2016, Citi will host six flagship events in major cities throughout their markets—school-wide reading celebrations that will provide financial-themed books for school libraries, as well as titles for students to take home. In addition, Citi is planning for 50 smaller-scale book award events for individual classrooms where bankers will use the Teach Children to Save curriculum to engage students. And it’s not just the students that benefit. “Not only is it fun and something a little bit different, but [employees]get a lot out of it personally,” Cameron says. “It helps them understand the community in such a better way than sitting behind a desk. Once [they]go out and engage, they tend to come back and want to do it again,” she adds. The concept of giving a kid a book is not a new one, Carlisle says, but at the core of these partnerships with First Book is the message that books still matter. It’s a back-to-basics approach to financial literacy that provides children with more than just financial know-how. Sometimes, to make a lasting impact, you don’t necessarily need a new, cutting-edge technology—you just need a good book.